Oxfam director Winnie Byanyima has been given another five years in office. File photo. 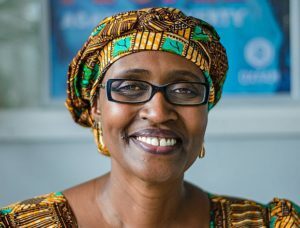 KAMPALA–Oxfam International has given Winnie Byayima another five-year term to serve as its executive director. According to the Oxfam International website, Byayima, a wife of Uganda’s leading opposition figure Dr Kizza Besigye, accepted the offer and commended the board’s confidence in her. “I feel a sense of duty to “carry on fighting, particularly for the women and girls in the South facing poverty and injustice” with whom Oxfam works,” Byayima said. Oxfam’s board of supervisors endorsed Byayima’s second term of office. Byayima joined Oxfam in 2013, after working with United Nations, African Union Commission and Parliament of Uganda. Byayima said she was proud of the heritage and all they have built upon it in five years. In her first term, Byayima initiated the “One Oxfam” restructure that enables Oxfam to be a more globally balanced organization with a stronger voice in the South and transforms decision-making so it is happening more directly from Oxfam’s country teams. Oxfam has welcomed new affiliates in Brazil and South Africa and a new observer member in Turkey. She recently moved the Oxfam International Headquarters to Kenya. “This is vital to our mission as we must influence change from a position of integrity,” Byayima said. According to Oxfam International website, Byayima also explained that in the next five years she was eager to expand and deepen Oxfam’s work in advancing women’s rights. “And tilt the balance” of Oxfam’s humanitarian work towards prevention, such as building up people’s resilience to the ever increasing and more intense crises,” she noted. She said she would push Oxfam to become much more ambitious in its understanding and use of the vast knowledge base of its staff, partners and volunteers around the world.